1. Pre heat the oven to 200°C/350°F/Gas Mark 6. 2. Peel and chop the onion and sauté in the oil until soft. Add the minced beef and break up as it begins to brown. Remove the stalk and seeds from the chilli, then finely chop. Crush the garlic and add both to the pan. 3. Stir in the chopped tomatoes and bring to the boil. Reduce the heat, cover and simmer gently for at least an hour. Stir in the drained red kidney beans and cook for a further 5 – 10 minutes. 4. Mix the herbs into the butter. Slice the baguettes (almost all the way through) into 8 - 10 pieces. Carefully add a teaspoon of butter into each slice. Cook in a preheated oven for 8 – 10 mins. 5. Cook the rice in the microwave as directed on the pack. 6. 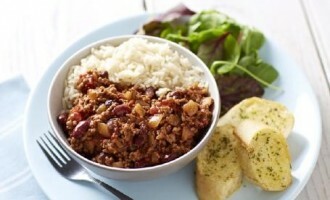 Serve the chilli with the cooked rice, herb bread and salad leaves. Top each portion with a generous teaspoon of natural yoghurt.